The region has also given birth to globally acclaimed scholars of language and literature like the late Professor Ali Mazrui, Professor Abdulatif Abdallah, Professor Alamin Mazrui, Professor Rayya Timamy, Professor Rocha Chimera, Professor Abdulrazak Gurnah from Zanzibar, Ngala Chome, Ali Attas, Alwi Shatry to name but a few. We also recognize a lot of other individuals who’ve written about the coast like Professor Austin Bukenya and M.G. Vassanji. The region is home to prolific poets whose works are as relevant today as they were back them, poets like Muyaka bin Haji who influenced many other poets from the coast and beyond, Shaaban bin Robert who was said to be what Shakespeare and Alexander Pushkin were to their countries. As such, the region has been endowed with a unique story telling prowess and created space for a wonderful fusion of languages as traders and missionaries spread from the coast to the mainland. Somehow, at some point, the prominence of the the written word in verse and prose yielded to the urgency and rise of music, so much so that the region is known for its Benga and Ta’arab than it’s writing. Verse however still remained stronger than prose. Hekaya has partnered with like-minded individuals and institutions like Creative Writers’ League and Writers Network Mombasa to curate forums where conversations about writing in the East African Coast can happen, and the space intendeds to bring together established and emerging voices to discuss writing the coast with literary enthusiasts and scholars from the region. 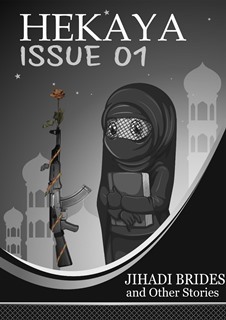 Our first publication, Hekaya Issue 01, brings together a dozen stories which represent a myriad of themes, and while we had several choices to pick from as regards the title, we settled for Moraa Gitaa’s ‘Jihadi Brides’, a narrative that explores the theme of radicalization which has been a constant thorn in the Coastal flesh. It’s a topic that many keep away from, yet the theme has the capacity to give a voice to many compelling, untold stories. At the same time we shall be publishing Kiswahili stories from a passionate bunch of writers who are under the mentorship of Lubnah at Creative Writers League. We hope to reach out to other writers in the other areas along the East African Coast. We enjoyed reading the stories and working with the writers to bring out the best in what they offered and we hope that having these stories in a space where they are open to critique, reviews and feedback will help us to tell the coastal story better and more boldly. A very well thought initiative. Congratulations to those who took part.